The poster for LILTING. The film is presented in the 2.35 CinemaScope ratio. The image shows Vann (Naomi Christie) and Richard (Ben Whishaw) in Junn’s room. Note also the graphics for the title. This film is a gem – a total justification of micro-budget filmmaking and public funding for cinema. Made for £120,000 under the Microwave scheme from Film London, the capital’s screen agency, it achieves more than most films on twenty or thirty times that budget. The Microwave scheme puts first-time feature directors through ‘micro-school’ involving a mentoring process with established practitioners including director Clio Barnard in this case. The process is explained in the Press Notes. Other Microwave films discussed on this blog include Shifty (2008) and Ill Manors (2012). Lilting is an example of a diaspora film as discussed in The Global Film Book and particularly in Chapter 4 as an aspect of British ‘national cinema’. It’s unusual in dealing with Chinese characters in the UK since there have been relatively few films to do this and they haven’t had much exposure. Director Hong Khaou’s family left Vietnam for the UK when he was eight, having already moved from Cambodia after Pol Pot came to power. Hong’s mother has never learned English and this issue of assimilation is central to Lilting, although the story is not autobiographical as such. 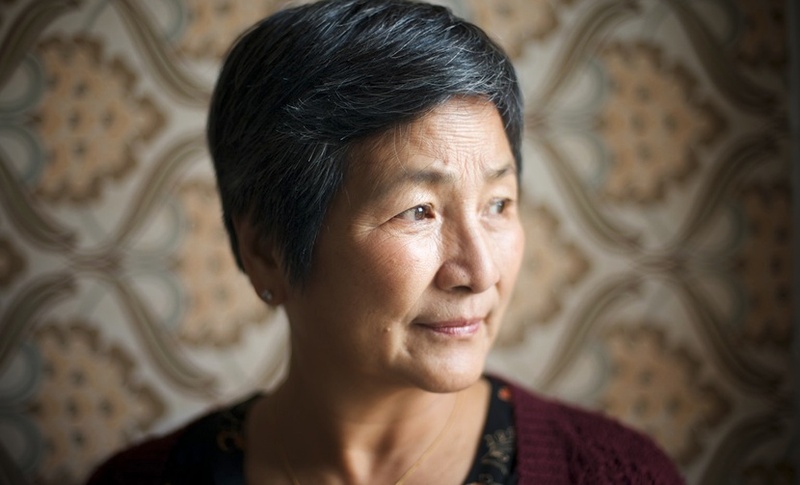 Lilting offers us Junn, a Cambodian-Chinese woman who now finds herself in her sixties in a care home in East London. She speaks six languages, but not English, and she is resentful of her son Kai and jealous of his ‘best friend’ Richard who may be the reason that she can’t live with her son. She is unaware that Kai and Richard are lovers. When Kai dies in an accident Richard in his grief attempts to connect with Junn. He persuades Vann, a young British-Chinese woman, to act as a translator and pays her to assist Junn in making contact with Alan, another of the home’s residents. Eventually, however, Vann finds herself with the difficult task of enabling Junn and Richard to deal with their grief and speak through her to each other. The strengths of the Microwave scheme are in the mentoring process which focuses on script development and the practicalities of shooting very quickly on a limited budget so that ideas have to be thought through carefully and preparations made accordingly. There is little scope for reshoots. It helps to have A List performers and Hong hit paydirt with his ambition in approaching Ben Whishaw to play Richard and the great Hong Kong action star Cheng Pei-Pei as Junn. In the role of Alan, a rather seedy old man, Peter Bowles offers an ironic performance for UK audiences (Bowles was a major TV star of the 1980s playing a gentleman ‘cad’ in sit-coms and more recently a major star of West End theatre). Given these stellar performers on screen it is remarkable that the first time screen actor Naomi Christie does so well as Vann – a tribute to both the actor and the director.
. . . a smart use of form to keenly evoke that strange, hard-to-communicate time in the aftermath of a bereavement, when the departed person remains a palpable presence despite their corporeal absence. I’ve noted in another interview (which stupidly I forgot to note down) a suggestion that this ‘presence’ of the deceased character is an aspect of East Asian film culture. Hong replies that his family has a shrine to his father in their home and I think it is the case that the film does enable an exploration of grieving which opens up a discourse across cultures. Clarke’s review also tells us that the script began as a stage play but without the LGBT dimension. The film does, I think, manage to make that work too as a gentle reference to cultural difference. Vann is a sensible and sensitive British-Chinese who provides the bridge – perhaps she creates the ‘lilt’? This is one of my films of the year and I urge you to seek it out. It’s still playing in cinemas and is available online through Curzon Home Cinema. This entry was posted in British Cinema, Diaspora film and tagged British-Chinese, Chinese in the UK, LGBT cinema. Bookmark the permalink.